At first, my aim was to display few A B C D letters on my tv screen. But it is not possible for a beginner to do it directly(at least in my case) without doing any hello world stuff on TV. The first and the basic hello world pattern which one could display very easily on his tv is a vertical line of desired thickness and position. This is very easy because we don't need to provide any vertical synchronization to lock the picture scrolling on vertical axis, what we need to provide is a horizontal synchronization only. We need to display a picture exactly on it's position relative to the coordinates of the tv display. ie we need to lock a picture frame on the screen and it should not vibrate or move up and down or it should not disturb the scanning rules. For this along with the analog picture data (.3 to 1v), we send few digital data of 0 - 0.3 v levels which do the synchronization process. There are two synchronizations , the horizontal synchronization and the vertical synchronization. Horizontal synchronization pulse in the signal makes it synchronized with the horizontal scanning. Similarly vertical synchronization pulses(a stream) makes it synchronized in the vertical direction , this ensures that the picture always starts from the top on each field(each interlacing fields) and locks the picture on the screen on it's exact position. 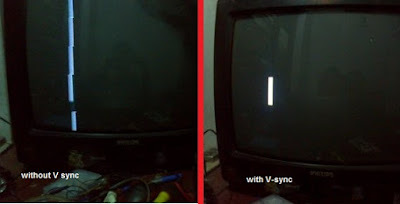 Vertical synchronization is a long compared to horizontal synchronization. full interlaced pal monochrome signal timing.. If we run the above code, we could see the white line is having many cuts. So we could easily observe that it is not stable in vertical axis. This will become more important if the picture is interlaced. I also tried the full interlacing but not posting it here because the procedure for that is almost same, we need to provide first vertical sync and then display first field at and then the second field's sync pulses followed by the second field data..
Can this signal be generated with at89s52 microcontroller? 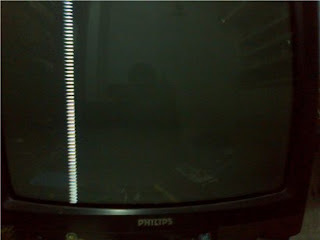 Hi i try to make this but on a lcd tv and it doesn't work can you help me ? Hi! 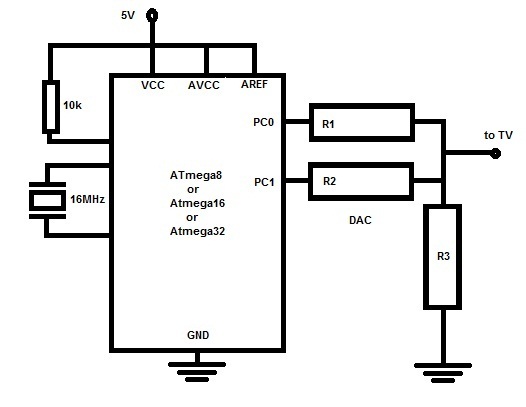 Thanks for this article, I'm gonna try this next week with my AtMega8 and 16, but there's one snag... There's only 41,6us for operations other than generating signal? That is not too much... When Your code will work for my TV, I'm gonna try to rewrite it using TCNT timer, so that will give much more time for other operations. Cheers! My wife manages the home much efficiently, and she hardly bothers me for repairing of gadets and accessories. 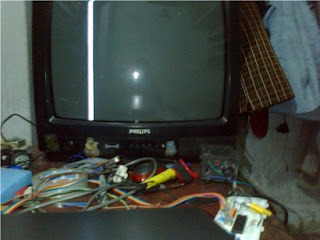 A few days ago, we had to face some hindrance in watching TV because something went wrong with the satellite receiver. I was surprised to know that mechanics reached our home within minutes, and my wife told me that they are from PE DSTV, and she has called them for troubleshooting. While we prepared some coffee, they restored the connection, and everything was done so quickly that I felt deeply impressed with their technical expertise.